I have lost count of how many times I would travel almost an hour from home (in Bombay), just to eat a tub of Sitaphal Cream at the famous Haji Ali Mosque! It is in high demand and people line up to buy it! Usually, when I love a food item this much, I am cheeky and try to cajole the chef to share the recipe with me. Sometimes I get it and most often I don't... no surprise there I suppose. If I can't get the recipe, then I try to deconstruct and recreate it myself; which is what I did with this one. Making Sitaphal Cream is as easy as it gets - few ingredients and just a few simple steps! Even though it doesn't freeze well, you can still have it at short notice. 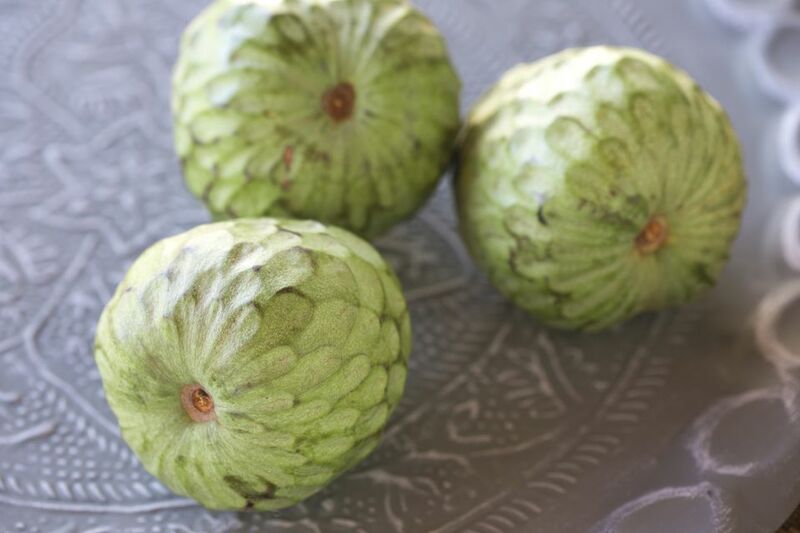 Deseeding custard apples is time-consuming work but totally worth it. One time-saving tip is to buy them in season and deseed a big batch, then divide into portions and freeze in freezer bags. That way all you do is take out, thaw and use when you feel the urge for a yummy, easy dessert! Sitaphal Cream is the kind of dessert that makes you feel you've died and gone straight to dessert heaven!! It is so rich and creamy. That said, you can only have a little at a time or then be prepared to exercise it off the next day! I feel like I need not say more on the subject. Try it! If you want smaller pieces of fruit in the cream, roughly chop up the fruit into pieces of the size you prefer. In a large, chilled, (preferably metal) bowl, mix the cream, powdered sugar, vanilla essence/ extract in a mixing bowl and stir to blend. Now add the deseeded sitaphal (custard apple) and stir gently to mix well. Chill again for an hour or so in the fridge and serve in large dessert bowls; small ones just won't do! This recipe can be adapted similarly to a few different fruits. It works well with Chikkoo (Sapodilla), strawberries, mangoes, pineapple, and lychees or a combination of these fruits. You can use fruit that is not too tart. It is probably not a recipe to try with most citrus fruits! Sitaphal Cream tastes really good as a side/ accompaniment with other desserts like Halwa; try it with Badam Ka Halwa or Moong Daal Halwa. Total decadence!